This recipe can be described in two words….comfort food! After a long workweek I crave my couch, my DVR and hearty, heart-warming food. Here’s a relatively quick recipe that’s both healthy and rib sticking. We’ve combined nutty whole wheat penne, wholesome peppers and onions, mixed it all with earthy Parmesan and topped it with spicy meatballs. Get the cozy jammies out, grab a great stout and get your belly ready for some serious comfort! Cover a large pot of salted water and bring to a rolling boil. At the same time, heat a medium skillet over medium high heat. Meanwhile, remove the stem and seeds from the bell pepper. Slice in half and then cut into ½ inch strips. Slice the onion in half, remove the peel, place each half cut side down and slice into ½ inch slices. Beat the egg if you’re using an egg as a binder. In a large bowl, mix the turkey with 2 cloves of minced garlic, ¼ cup of parmesan cheese, panko, Italian seasoning, red pepper flakes, salt, pepper and the beaten egg or milk (if you’re using milk rather than the egg). Mix just enough to combine the ingredients. Form into 1 ½ inch meatballs. Add 2 tbsp of EVOO to the skillet. Brown the meatballs evenly. They’ll finish cooking in the oven so you’re just looking to get a good sear on the outside. This should take approximately 4 – 5 minutes. Remove the meatballs once they’re golden brown, place them in a baking dish and bake them for approximately 15 minutes or until they’re cooked through. Add the onions and pepper to the same skillet and sauté until the onions begin to caramelize. The veggies will also deglaze the pan and pick up all the yummy, meaty goodness left over from the meatballs. When the veggies are done, remove the pan from the heat. While you’re sautéing the veggies, drop the pasta into the pot of boiling water and give it a quick stir to keep it from sticking together. Cook for about 9 minutes or until al dente. This just means they still have chewy, toothsome texture rather than being completely cooked. Once the pasta is done, drain it reserving ½ cup of the cooking liquid. Add the pasta to the pan along with veggies and return the pan to the stove over medium high heat. Add the cooking liquid plus the other ¼ cup of cheese to the pasta and veggies and stir constantly. The cheese should melt into the cooking liquid while the pasta begins to absorb the moisture and cook the rest of the way through. When it’s done, the liquid should be almost completely absorbed leaving the pasta and veggies coated in cheesy goodness. 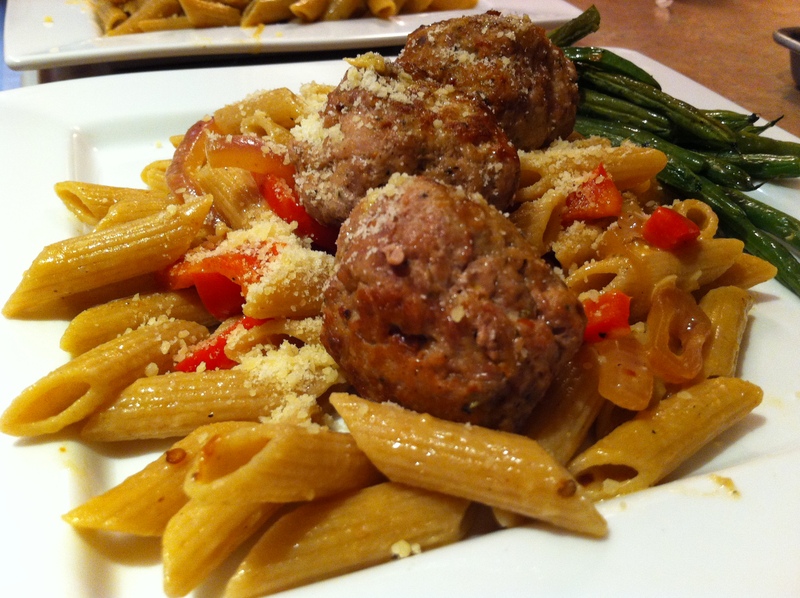 Add some pasta and veggies in a bowl and top with 2 meatballs. Finish off by adding a sprinkle of parmesan on top. The meat in the meatballs is up to you! Change it up and use any type of ground meat you prefer. Pork, beef and veal combos are traditional and tasty but try chicken, buffalo or even tuna. Just be sure to add a touch of EVOO to the mix if you’re using a lean cut of meat to keep it moist.